It has been a decade since two seminal reviews demonstrated that mixed-valence compounds share many unique and fascinating features. The insight pro- vided by those early works has promoted a great deal of both experimental and theoretical study. As a result of extensive efforts, our understanding of the bonding and properties of mixed-valence compounds has advanced substantially. 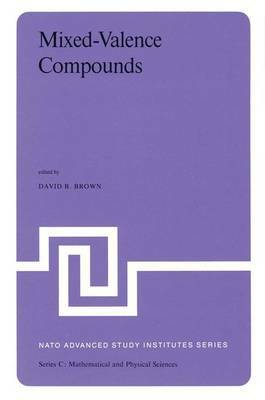 There has been no compre- hensive treatment of mixed-valence compounds since 1967, and the meeting convened at Oxford in September, 1979, provided a unique opportunity to examine the subject and its many ramifications. Mixed-valence compounds play an important role in many fields. Although the major impact of the subject has been in chemistry, its importance has become increasingly clear in solid state physics, geology, and biology. Extensive interest and effort in the field of molecular metals has demonstrated that mixed-valency is a prerequisite for high elec- trical conductivity. The intense colors of many minerals have been shown to be due to mixed-valency, and the electron-transfer properties of certain mixed-valence metalloproteins are important in biological processes. Experts from all of these areas participated in this meeting, and the truly interdisciplinary nature of the subject made it a unique learning experience for all in attendance.